Thank you all for the contributions to this evolving thread... it was almost shocking to see this news break yesterday, because knowing the immense pressure upon the Captain on board to do the right thing and make the right decisions. That could not have been easy when facing something that could have gone disastrously wrong so quickly. Seeing the waters and area they drifted through, it's nothing but a miracle they avoided ripping up the entire bottom of the ship. It must have been a horrific experience for everyone on board, as we can see from videos shared from aboard the ship. Captain, the news tells us that Hustadvika is shallow but what does that actually mean? Just how shallow is it, and are the reefs well charted? Hustadvika is known as a very dangerous part off the coast, with shallow water and underwater rocks a-plenty. You have to follow a certain "path" through these waters, and once you are sailing out of these "lanes" you will quickly find yourself in a whole lot of trouble. Most, if not all, reefs are well charted but there are really a lot of them. There are like the dropping of a mouse spread out over an area. 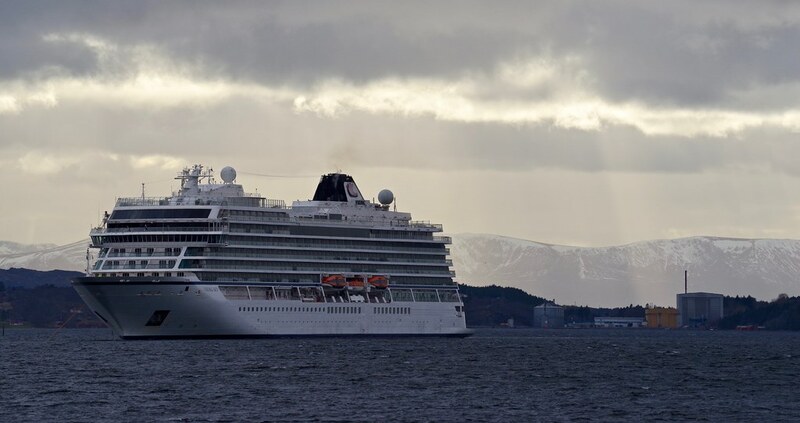 BBC is now reporting that VIKING SKY is heading to Molde after "rescuers airlifted almost 500 of the 1,373 mostly elderly passengers from the ship in bad weather". Apparantly "the vessel's engines have been restarted" though it's unclear whether or not she is fully under her own power. An earlier report said three of the four engines had been restarted. Anyway, it sounds like good news even if they are not yet completely "out of the woods". I’ve been following Viking Sky during the day on MarineTraffic and NRK ...and also on moldewebcams.net when the ship finally arrived safely in Molde this afternoon. Here are some 'captures' from their wonderful live camera. What a relief for everyone, not least the Captain. And as we understand it, only minor injuries. It was reported (at some stage) that 436 guests and 458 crew remained on board. It's not clear whether or not these numbers were correct when she eventually came along side in Molde. Sorry to ask a totally irrelevant and nerdy question: why are these sisters always letting out this strange type of smoke? It don't look like ships smoke, more like some kind of water based steam? It does indeed look more like steam than smoke. I would almost surely believe it is waste steam, as in water vapor. The color of this smoke is definitely not from the smoke of diesel engines. Scary! I think I'd prefer to take my chances on the ship. 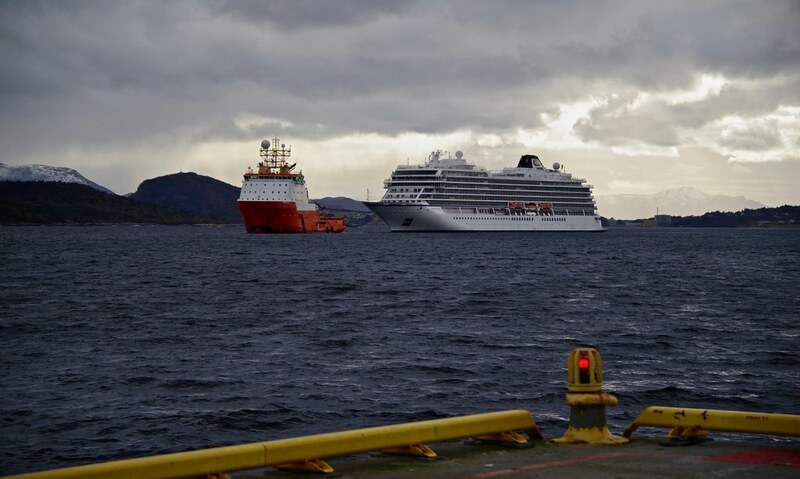 As we know, Viking Sky is presently moored in a city south of me, but now there are negotiations between the owning company, Coastal Administration (Kystverket), Lloyds and others, to move the ship to Kristiansund so that it can be repaired here. Last edited by Sterkoder; March 26th, 2019, 20:08. And Hagland Captain seems to be moored in Bremsnesfjorden, Averøy. I wonder if they tried stopping their voyage with the use of anchors? The anchor seems to have picked up a lot of rubbish and old ropes from the bottom, and it appears as if that's from the location. I was also thinking where will she go for wet-dock repairs. I initially thought it would be down in Ulsteinvik, but Kristiansund is probably an equally good place. I guess it's Kristiansund mekaniske (a repair ship yard) who will be dealing with this. As far as engines and propulsion goes, they are the real experts along this part of the coast. That yard has a major deal/contract with Fjord1 (among others) to work on the ferries when they need repair, annual inspection and such. I belive Viking Sky will be in good hands. I would have thought maybe Vard Aukra, but not sure if they have a wharf capable of handling this size of ships. The other three Vard yards in the vicinity are busy building cruise ships. Since this work will mostly involve furniture and fittings, any place with a suitable wharf and good communication will do. The machinery repairs, whatever that may be, will be handled by the manufacturers and their sub-contractors.The hotels in Kr.sund will be busy. PS> Her ETA at Vestbase is 1530 hrs. 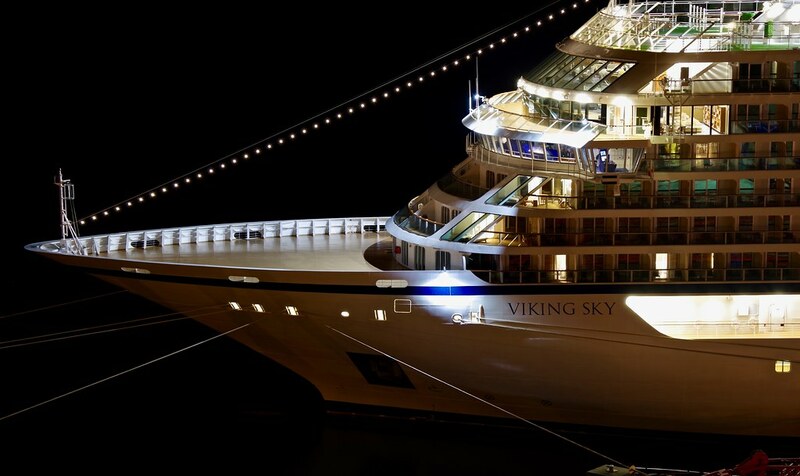 The VIKING SKY is operational and technical operated by Wilh. Wilhelmsen. The NORSEA Group, owner and operator of Vestbase, is owned by Wilh. Wilhelmsen. 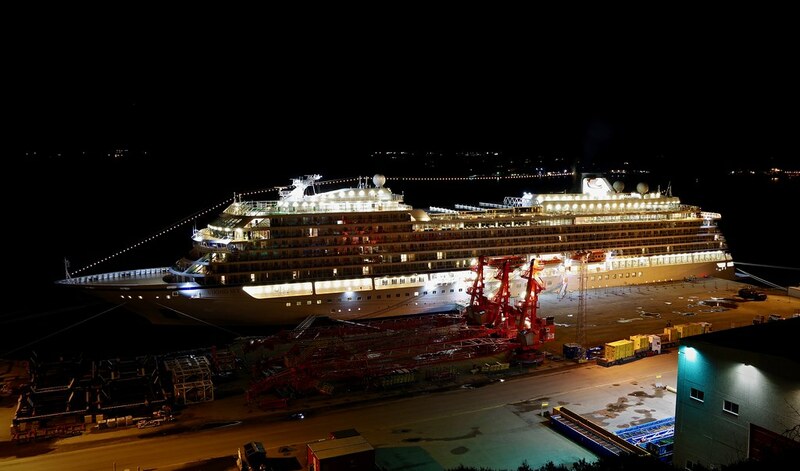 So I guess, there's the link between the cruise ship and her mooring at Vestbase. The repairs is internal anyway, so they don't need a dock in the true sense of the word. I'm a bit curious about why it wasn't possible to restore the lubricating oil pressure to any engine during such a long time. Well, the final investigation will probably tell us. 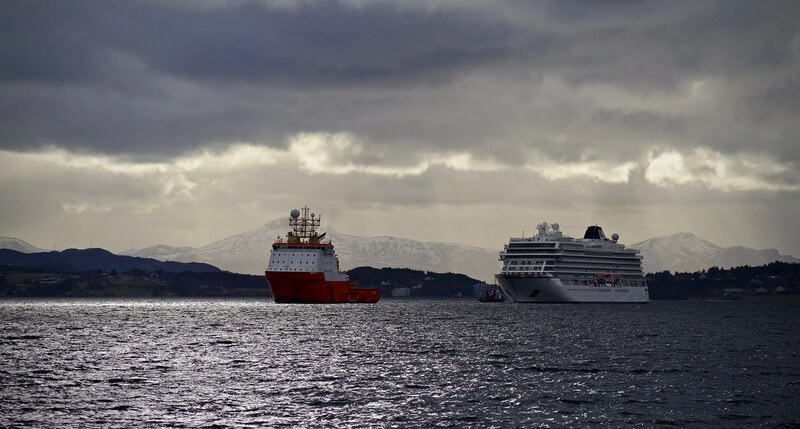 VIKING SKY sailed the outer lane from Molde to Kristiansund today, and even if she sailed with all four engines working, she had a tug connected at the bow. The reason for this is that both anchors are gone, one lost at sea and the other with broken wings. 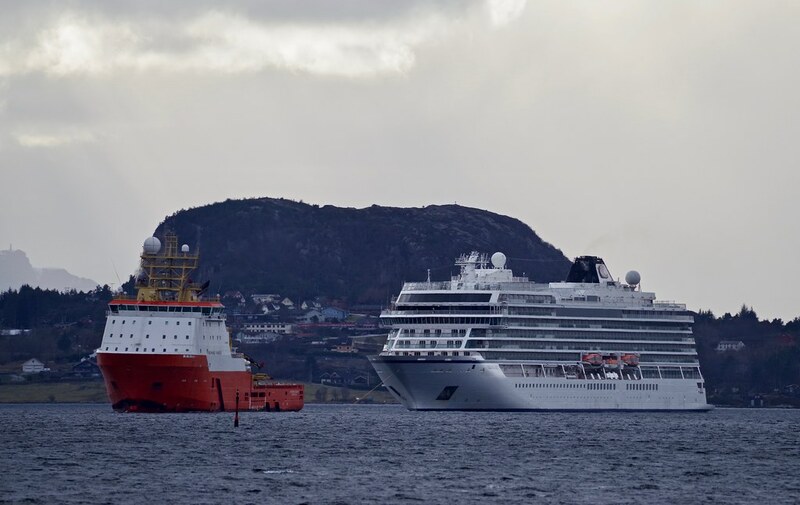 Anyway, here we see the tug NORMAND RANGER and VIKING SKY arrive in Kristiansund around 4:00 PM today. I had my 150-450mm lense mounted and with access to the ISPS areas, here are my pictures (even though no one got access to quay #8). I am surprised that it is possible to loose both anchors. Was it a desperate action, to fix a ship of that size in open, stormy sea? Trying something which is almost clear that it does not work? Or were those anchors underdimensioned? Correction on that. The anchors held (I.A) with some help from the propulsion once they got one engine restarted. When they had enough engine power to move out the could not get one of the anchors in because the chain had crossed over the bulbous bow. As the normal things you can do to solve that was not avialiable to them under the circumstances, they cut the chain to get away safely. The other anchor was damaged but recovered. They still had the sense to note the exact location, so I would think there will be an attempt to recover the 270 m. of chain and the anchor once the present storm has blown over. Thank you for what must be the correct version. Thank you both! Wow, only three meters left, that was really close. From all what i heard and saw in the news, it did not seem so dramatic! So what was looking quite funny, was the result of a great job. I am sorry for my stupid suggestions. Once you loose lubrication oil pressure from the tanks because of low level, it would take some time to refill them again to a level where it wouldn't happen again. That is, after they realised what the problem was. I have experienced the "anchor-over-the-bulbous-bow" a couple of times myself, but all those time we had time on our side, place to manoeuvre and a whole lot better. It's a hassle but with those three assets in box, it's doable. The Viking Sky didn't have any of these three items on their list - the only option was to cut and leave. Better leave the anchor than the ship. BTW, I have sailed with her Captain a decade and half ago, on Crystal Symphony. He is a very competent and skilled person. Great night time images, Sterkoder!